Children of Heaven (Bacheha-ye-Aseman), Majid Majidi’s exquisite third film, was released in 1997, right after his second film, Father (Pedar), and it became the fir st Iranian film to be nominated for an Oscar. Shot on a budget of about US$ 180,000, the film subsequently grossed about a US$ 1 million and propelled both Majidi and Iranian cinema in general to much greater international attention. Since the narrative of this film, like a number of other Iranian films, such as Where Is My Friend’s Home? and The White Balloon, is centred around children, it has frequently been compared by critics to those other films (see the commentary about children-centred themes in Iranian films in my review of Jafar Panahi’s The Mirror). 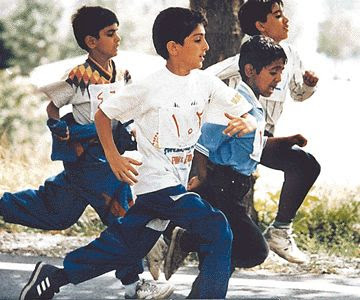 But since Children of Heaven is quite distinct from those other Iranian films and stands head-and-shoulders above them, it is worth reflecting on the particular merits of this film and how they were achieved. The story concerns a 9-year-old boy, Ali, and his 7-year-old sister, Zahra, who live with their parents in a meagre one-room flat in south Tehran. At the outset, Ali has been sent to have his sister’s shoes repaired, but on the way home the repaired shoes are mistakenly taken away by a city ragpicker while Ali is dutifully shopping for some potatoes that his mother needs. This establishes the “problem” that drives the rest of the action. Ali is mortified by having lost the shoes, knowing that his family cannot afford to replace them and that he will be severely punished for his error. He and his sister take the only option that appears: since they attend school at different times, they must share Ali’s sneakers, without telling their parents. In the morning Zahra will wear the sneakers to school and then rush to pass them to Ali for his afternoon school. But this is not easy. Zahra must duck out of school early each day to give the sneakers to Ali, who then must sprint to his own school, where he inevitably arrives after the bell. This is not a sustainable arrangement, and we know that something will have to give. There are other episodes that crop up and play into this narrative. Zahra spies from a distance another schoolmate who is now wearing her lost shoes. Now she has to figure out how to get them back, but her plans are ultimately abandoned when she learns that the father of the new shoe owner is blind and in even worse economic circumstances than her own family. So the basic problem is still not solved. Ali, for his part, accompanies his father to the wealthy neighbourhoods up the elevated slopes of north Tehran, where his father hopes to land some gardening work. Thanks to a bit of luck and Ali’s pluck, they do finally land a gardening job, and it appears that some extra income might actually enable new shoes to be purchased. But, again, hopes are quashed by misfortune. The father, riding the bike with Ali aboard on the way home, loses control on the steep downward-sloping streets towards south Tehran, crashes the bike, and suffers some minor but debilitating injuries. Finally, another opportunity arises. There will be city-wide cross-country (4-kilometre) race for 9 and 10-year-olds, and the third place finisher is to be awarded a pair of new sneakers. Ali tells Zahra that he will somehow finish in third place and then give her the awarded sneakers. This leads to a highly dramatic climax, as Ali barely manages to qualify for the race and, as the race ensues, work his way towards the front of the pack. Can he reach the front, and, even more problematically, can he finish in third place? At the finish line, there is a wild lunge by several boys at the front, including Ali, to cross it, and Ali ultimately learns from the smiling, excited school officials that he has finished first! He has won a prize, but not the right prise, and, alas, the new sneakers remain out of reach. The end of the film shows Ali taking off his now completely worn out and ruined sneakers and disconsolately soaking his blistered feet in the housing compound goldfish pond. Now, finally, he and his sister don’t even have one pair of shoes, and ruin awaits them. In an effort to get more real-life performances, Majidi also employed hidden cameras, which must have made the shooting quite a bit more complicated. Nevertheless, with limited budgeting, external constraints, and hidden cameras, Majidi managed to produce a smooth and artistically told story in an urban setting. This seems to have led some of the postmodernist critics concerned with supposed “authenticity” in filmmaking to criticise Children of Heaven for being “manipulative” and not true to life. But I would argue that it captures and presents the very real, dramatic experience of children better than almost any film. All films are, to a certain extent, “manipulative”, but Children of Heaven is far more true to life concerning the emotional ups and downs of a child. It compares favourably to two other monumental achievements in cinematic storytelling about children, Vittorio De Sica's Bicycle Thieves (Ladri di Biciclette, 1948) and Satyajit Ray's Pather Panchali (1955). Throughout the film, the two child leads, in particular Amir Farrokh Hashemian, who plays Ali, experience and express fears, expectations, and concerns that dominate their worlds. There is the fear of punishment, the desperate need for approval from adults, and the concern for following and living up to the all-powerful laws that have been set up for them by adults. And, of course, there is the feeling of loyalty and comradery among their siblings and peers. We can talk about these ideas abstractly, but they come back to our recollections powerfully when we see them portrayed so well by the players in Children of Heaven. On numerous occasions Ali is unable to give satisfactory account for his actions to the demanding adults around him and is driven to the point of tears. We feel his desperation and share his dreams. Thoughout much of the film, Ali and Zahra are shown sprinting through the alleys of their neighborhood in utter desperation. This is not fun; it is, for them, almost a matter of life-and-death. The cinematography here is excellent, capturing the breakneck speed that must be adhered to in order to keep their secret for another day. And no matter how fast they run, it not quite good enough. When we get to the final cross-country race, it is a continuation of this desperate and exhausting search for salvation. This is what youth often is much of the time – a world of impossible demands and an unending sequence of somewhat scary encounters with intolerant adults. We adults have forgotten this, but the interior reality of this experience all comes back when we watch this film. The bittersweet ending of the film is important, but seems to have been misunderstood by many commentators. Ali has failed in his quest to win the shoes and save his sister (and himself) from further suffering. He sees himself as a failure. It is not a feel-good story; it's a story of frustrated dreams. We observers know, however, what Ali doesn’t: that his father has, in the meantime, already bought replacement shoes for both himself and for his sister, Zahra. We want to comfort him and praise him for being so good – for loving his sister, for helping his parents, and for being everything that a parent would want a child to be. Tomorrow we know this particular drama will turn for the better, but the dramatic life of a child, with all its never-ending anxieties, will go on. This is the essence of childhood, captured on film. Wonderful critique for this beautiful film! However, one important item has been overlooked [? ], at least not mentioned. Towards the end of the film, the Dad is seen buying two pairs [stacked at the back of his bike in cardboard boxes] for his children. Many who saw the film has failed to note that. I personally liked it very much, because for me, hope springs eternal..
You are quite right, archis. That's what I meant to convey in the final paragraph. very nice review! i would love if you explain the symbolism of goldfish. also the treatment of music in this film as only 5-6 times background music was used!